Winner of the 2015 COVR Award for Best Self-Help Book! Blamestorming outlines the reasons why our daily conversations go wrong, explains how to respond when they do and provides tips on how to stop them going wrong in the first place. Based on his experience as a highly respected communications coach for international companies and business professionals, Rob Kendall provides a practical guide to achieving more rewarding and effective interactions with everyone in your life - from your boss to your partner. Rob's techniques have been proven to be effective for thousands of people from all walks of life and are presented in an illustrated step-by-step format that makes them easy to put into practice from Day One. 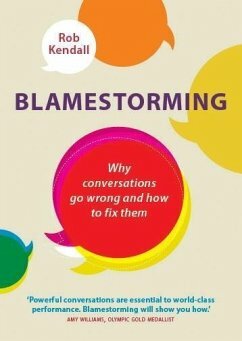 Underpinning the book's approach to consistently having better interactions is an explanation of the warning signals that indicate when a conversation is going off track. Over the last 20 years Rob Kendall has become a highly respected management consultant and authority in the field of communication, working with tens of thousands of people, both in public programmes and with business leaders in over 50 organisations on every continent. He has worked as a coach with many high profile international companies including American Express, Société Générale, and Zurich Banking and has spoken on leadership, communications and change management. He has also worked with sports professionals and with leaders in international conflict zones, and co-founded a technology company. His longstanding aim is that one day every child will learn the art of conversation as part of the school curriculum, and to this end he recently led a Thinking and Communication programme for teenagers in a secondary school in southwest England. The author lives in UK.